For those of you who don’t, the boiler room was a room filled with inside sales people of dubious character selling investments of even more dubious value. While that’s a bit of an exaggeration, many of us still have the impression of sales teams working in large call centers as the way inside sales are typically done. With the advent of cloud-based sales technololgy, it’s just as likely today that an inside sales team will be composed of individual sales reps working remotely from their homes or distributed office space. The concept of a remote sales team has its pros and cons. On the pro side, companies aren’t constrained by geography in hiring – they can hire the best people for the job regardless of location. They don’t have to invest in office space and other overhead to support a local sales team. Sales reps like it too. They can balance their professional and personal lives and make good money doing it. On the con side, remote sales teams present management challenges for businesses. Keeping reps motivated, on message and productive requires special attention. Once again, technology has the answer. Many of our customers are running successful remote sales teams that consistently hit their goals. Here are 4 simple tools that help their remote sales teams close more deals. TeamVisibility is cloud-based sales analytics software that uses call analytics to help each remote sales rep see what’s working, what’s not and what they can do to improve. With TeamVisibility, you plug a call analytics device into the reps telephone and the software monitors calls to identify “success markers” and “problem points” to score each call. The software provides tailored feedback to each rep and aggregates data to provide sales managers with team-wide feedback, analytics and trends. TeamVisibility gives sales managers the ability to provide specific feedback and coaching to each rep based on their call performance. You don’t have to wait for months to see if reps are performing to expectations or not. Simply stated, TeamVisibility does exactly what its name implies – it gives sales managers visibility into remote sales team performance. 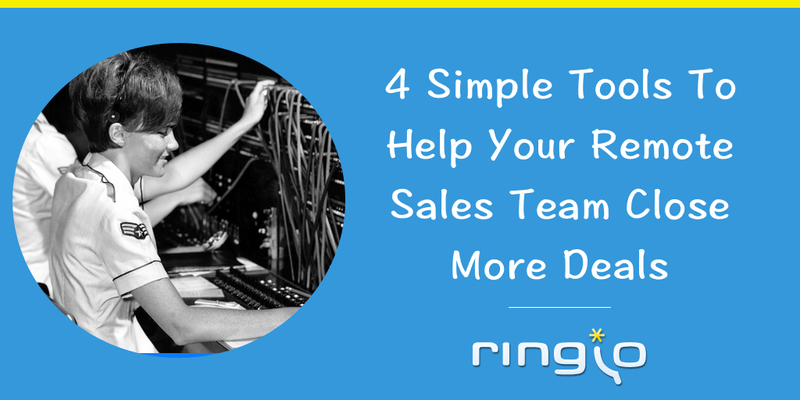 At Ringio, we’re proud of how our software helps remote sales teams be more productive. Ringio is a cloud-based CRM-integrated calling platform that increases sales team productivity by automatically tracking call data into the integrated CRM. Ringio tracks activity into the integrated CRM so that sales reps can focus on selling. Ringio provides sales managers with analytics on each rep’s activity to identify best practices so that they can be spread throughout the sales teams. Ringio also records calls so that sales managers can review sales calls and give reps coaching on their sales techniques. Ringio also routes inbound calls to the appropriate rep – wherever they are located. When a customer calls, an auto-attendant routes the call appropriately, whether it’s to an IP phone on a desk, a softphone on a computer of to a cell phone. We also provide reps with complete caller history so that they can tailor their call regardless of who has spoken with them before. Many of our customers have come to us for help bringing remote sales teams together. Ambition is a sales motivation platform that is based on the oldest motivator in the world – competition. Ambition is a sales gamification system that measures rep, manager and organizational performance against benchmark expectations. For example, a rep may have a goal for calls, demos, free trials and sales in a given time period. Ambition integrates with CRMs to measure rep performance against goals to provide a visualization of where the rep stands compared to expectations. Ambition even measures sales manager performance by averaging the scores of the managers reps to compare against expectations. A remote sales rep sees the visualization of her performace against goal and knows that her manager is seeing it too. If that’s not motivating, I don’t know what is. Today’s sales rep isn’t just using the telephone to sell – email has become an equally important sales communication tool. Sidekicks for Teams by HubSpot gives reps and managers insight into how well their email performs. Sidekick tracks email opens and clicks so that sales reps know if what happens to their emails once they’ve been sent. It also lets reps know when a prospect visits the company website and which pages they’ve viewed. It’s great to know when that hot prospect is looking at your pricing page. Sidekick also gives reps the ability to see company information when they’re on a prospect website by clicking a button in the corner of the web page. Sidekicks for Teams also aggregates data for teams and provides weekly analytics to sales managers. Sidekicks provides the same insight into email performance that Ringio provides for calling performance. 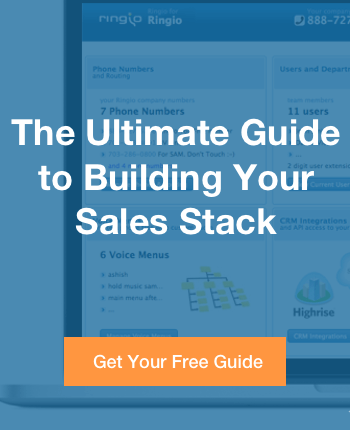 Yes, it’s possible to manage a successful remote sales team – many companies do it every day. By choosing the right technology and integrating it properly, sales reps and managers can get their jobs done remotely (and balance their lives while doing it.) If you manage a remote sales teams, use these 4 simple sales tools to help your remote sales team close more deals.